I purchased this during the 50% off sale when the latest round of new arrivals were released on Factory’s website. After seeing that the sleeves were not white underneath like the photo shows, I knew I had to have it. I have the Retail and Factory versions of the short sleeve Raindrop lace tee that this blouse is modeled after and I wear them all the time. I went with a 12 in this, to be conservative, I might have been able to get away with a 10, but I didn’t want to deal with any pulling in the chest area. Excuse the bathroom shot. The only time I can take photos during the week is early before I leave for work and by the time I get home it’s almost dark. Photographing the black top was a little tougher – but you get the idea. I love this top. It’s a little looser but I think going down a size might have been a smidge tight. My eternal struggle of being between two sizes. 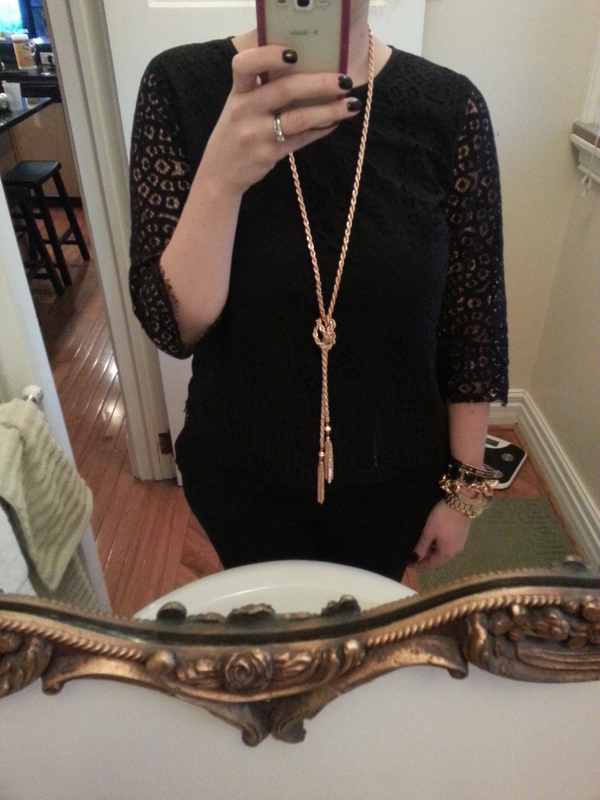 And I wasn’t planning on wearing all black to work…but I had my new Iced Lariat necklace from Baublebar I was dying to wear. I swapped out my patent pumps for my Banana Republic Bailey studded flats and overall was pleased with the combination. This top will look great with jeans, pencil skirts and was easily layerable under a blazer. This is a keeper. I was on the fence about this top but had admired the retail version and figured for the 50% plus my extra 20% off, I’d give it a shot. 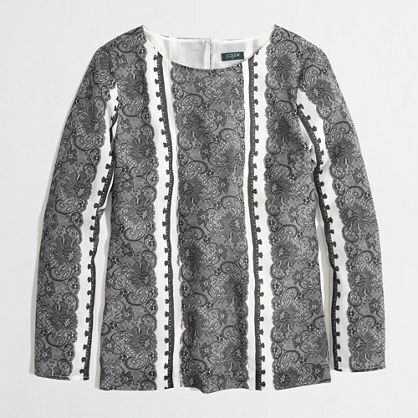 It looks like a blouse you could dress up or down and who doesn’t love black and white? The question was if the lace print would look cheap, and it’s of course polyester compared to the retail version that was silk. I went with a large, again, erring on the conservative side. 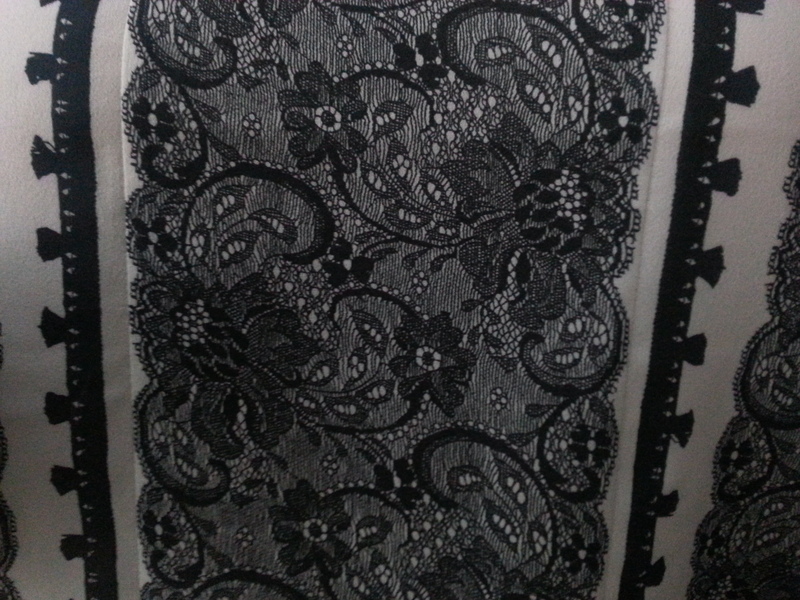 The center lace pattern is very intricate and in my opinion, you can’t really see from a distance that it’s a print. Those darn strips down the side bugged me though, they definitely look printed and the seams also annoyed me. Even if this had fit better, I’m not sure I could have looked past these items. But I’m glad it didn’t look good on me because it made it easier to dislike this part of the blouse. So, off to the outlet this weekend. My email tells me that the Factory Stores are doing 40% off this weekend so maybe I will find some other fall goodies. 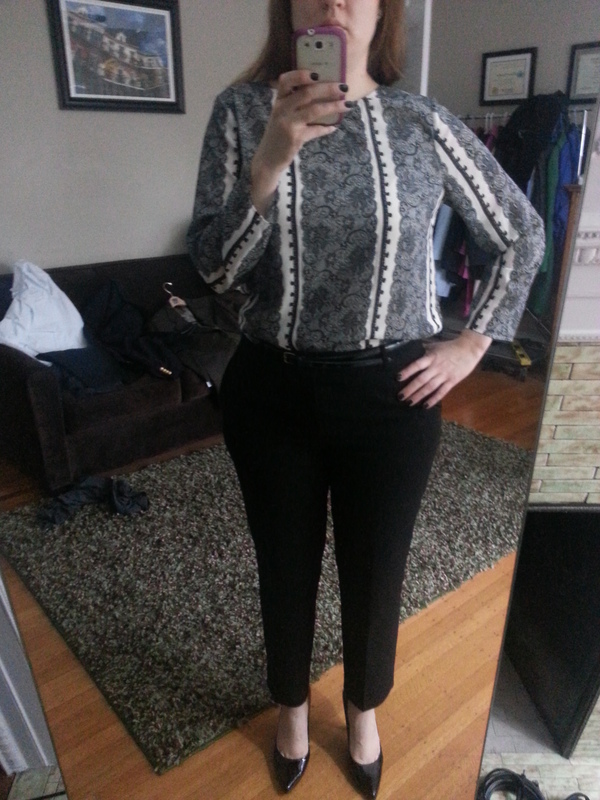 Another item I ordered was the factory version of the Tilda – it is the EXACT same shirt. Or at least the stones are spot on. The shirt fabric is more textured and I actually like it a bit better than the retail version. So – what do you think? Do you have or are you planning on purchasing either of these items? What else are you loving from Factory these days? It seems like every other day I’m placing an order – their prices are reasonable, the sales are good and on items like the merino Charley sweater, I’m finding them to be almost identical to retail at a fraction of the price. Thanks for visiting! 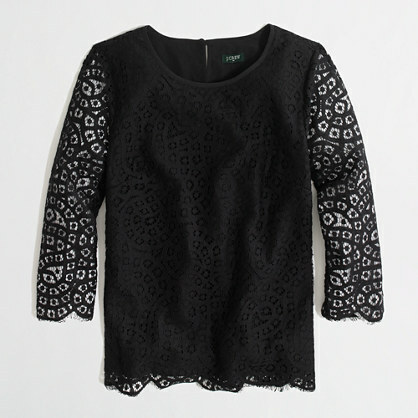 I am heading to the Factory store to check out the offerings…hopefully they will have the lace top for me to try! Love your blog….I am also a size 10-12, so I particularly appreciate seeing your outfits and reading your thoughts on certain pieces. Thanks for sharing your thoughts and opinions! 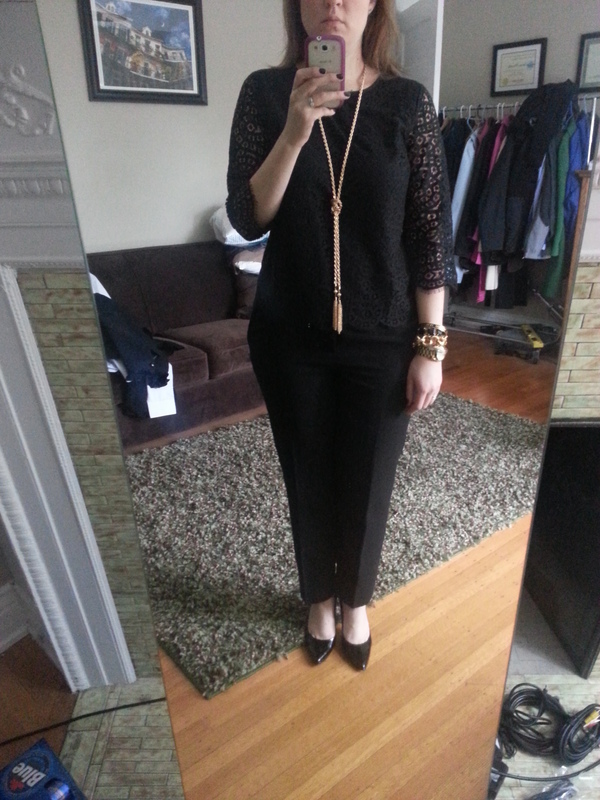 I did pick up the black Scalloped Lace Top…it will be so pretty for holiday parties. I also picked up the Kelly Green polka dot Charley sweater….so cute, as well as the Tilda dupe jewel collared shell in blue. So glad you got the lace top! 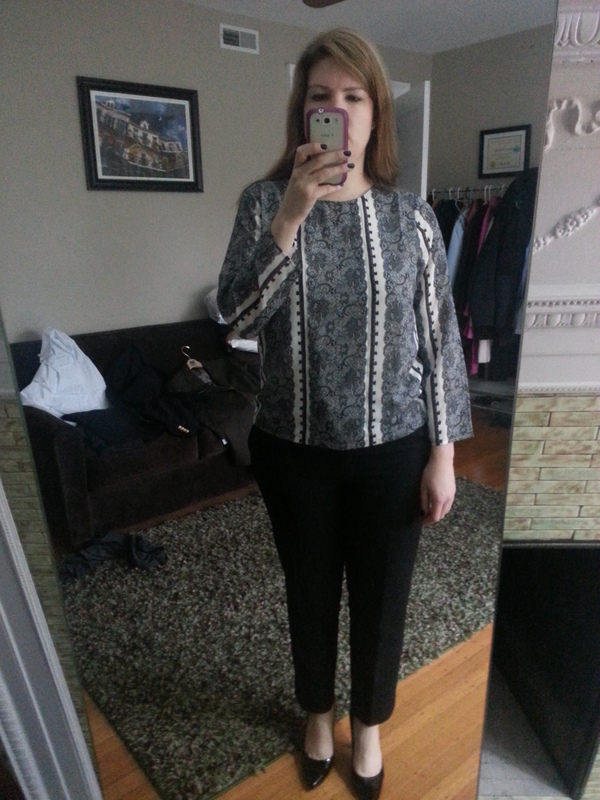 I recently picked up the white Tilda dupe to have a backup…it is literally the exact same shirt. And the polka dot sweater – great pick! thanks for sharing! !